Support and co-ordination of fight against rabies in Africa under One Health concept. Develop a program based on experience in India under the Mission Rabies project and co-ordinate with other rabies oriented projects. Mission Rabies is currently underway in Malawi. 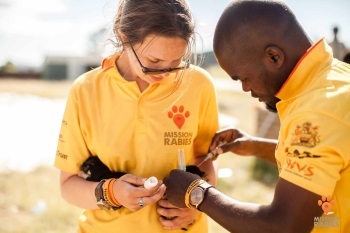 To give you a personal idea, some volunteers with the Mission Rabies team in Malawi have set up their own blogs, keeping us up to date on how we are progressing. These volunteers have worked in both stationery clinics and going door to door through the local neighbourhoods vaccinating hundreds of dogs. Rabies is a vicious disease. A recent study estimates that every year about 59,000 people die of rabies – that’s more than 160 people every day. 99% of all cases are transmitted by dog bites. 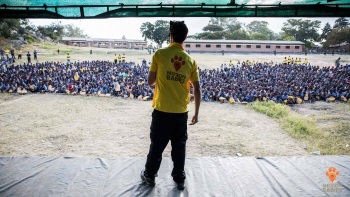 British veterinarian Dr Luke Gamble founded Mission Rabies in 2013, after seeing the devastation rabies brings to poor rural communities while volunteering for UK-based charity Worldwide Veterinary Service. Determined to change the situation and save both human and animal lives Mission Rabies was launched in September 2013 in 10 key Indian cities to vaccinate 50,000 dogs in just one month. This colossal effort had the goal to demonstrate that projects on such a scale are feasible and the highly motivated teams consisting of local and international volunteers even surpassed the set goal and vaccinated 60,000 dogs in the set time frame! Motivated by the success of this initial campaign, Mission Rabies expanded ever since, both within India and since 2015 also in other Asian and African countries. Based on 4 pillars or “core principles”, Mission Rabies projects combine the swift mass vaccination of dogs, humane animal birth control (ABC), education and establishing rabies surveillance. Mass vaccination is the proven way to eliminate rabies from the dog population of an area or country. Culling of dogs, which is unfortunately still a wide-spread response to rabies outbreaks around the world, has been shown to be absolutely ineffective. Mission Rabies therefore requires governments to cease culling measures and rather invest the resources and staff into mass vaccination of dogs. To ensure sustainability, projects are run in partnership with governments and local animal welfare organisations under the technical guidance of Mission Rabies. 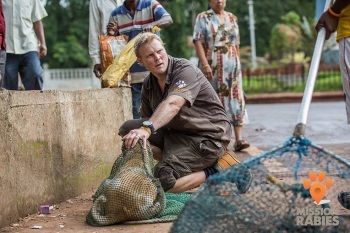 In 2014, the Mission Rabies Goa project proved that a state-wide attempt to combine dog rabies vaccination and humane surgical ABC can be successfully carried out, sterilising and vaccinating more than 20,000 dogs in just half a year in the Indian state of Goa. The sterilisation of dogs is carried out in partnership with Worldwide Veterinary Service (WVS), who have experience in running mass-sterilisation campaigns around the world. Prevention is better than cure – following this well-known motto, Mission Rabies projects are accompanied by a massively successful education campaign. Targeting communities and especially children, who are among the most vulnerable, Mission Rabies education teams are teaching about the dangers of rabies, what to do when someone gets bitten and about responsible dog ownership. The Mission Rabies education programme has been officially endorsed by the Government of Goa as an integral part of the school curriculum in the state. The absolute bedrock of the Mission Rabies projects is a scientific approach to the problem and establishing a working rabies surveillance system in the project area to get baseline dog population and rabies case data. This is especially important as such systems hardly exist in most rabies affected countries. To ensure a smooth data collection during the vaccination/sterilisation drives and to spatially map out rabies cases in the project area, Mission Rabies developed an amazing smartphone app, which facilitates easy data collection and analysis of the dog population in the targeted area. If you are interested in learning more about Mission Rabies’ work or volunteer at one of the projects, please visit their website http://www.missionrabies.com and make sure to follow them on Facebook and Twitter for regular updates.